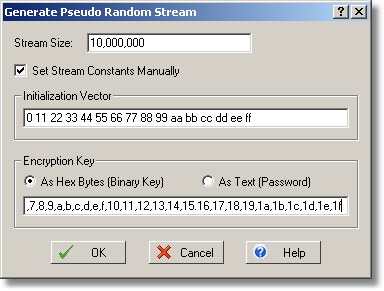 This command generates a cryptographically strong sequence of pseudo random numbers. In order to generate a stream enter the desired stream size in bytes and press OK. Spaces and commas in the number field are ignored; you can use them to format long numbers. The resulting stream will be placed into the clipboard – use the Paste command to insert it into a stream being edited, or paste it to another application like Windows Explorer. The random stream is a sequence of 128-bit blocks. Each block is produced by encrypting the previous block with the AES cipher. The initialization vector is used to produce the first block. This implementation corresponds to the standard OFB (Output Feedback) encryption mode, that is applying the generated pseudo random stream to a plaintext will result the AES OFB encryption. By default the program uses a zero initialization vector, and a random encryption key produced by hashing the current time and the processor clock counter values, thus generating different streams on every call. You can set the initialization vector and the encryption key manually. You must specify at least the encryption key if you want to be able to reproduce the same encryption stream. Enter the initialization vector as a hexadecimal 16 byte long value, separating bytes with spaces or commas. If you enter a shorter value, it will padded with zeros. If you enter more than 16 bytes, only the first sixteen bytes will be used. Enter nothing if you wish to use the default zero vector. The are two methods of specifying the encryption key. You can enter it either directly, or as a text password. Enter a binary key by specifying up to 32 hexadecimal bytes. A shorter value will be padded with zeros; a longer value will be truncated. Enter a password as an arbitrary length text string. The actual 256-bit key will be produced by hashing the string with the SHA-256 secure hash function. Note that leaving the input field empty will cause generating a random key.